Environmental Management Systems Association Inc - What is an EMS? EMS users frequently find a host of unexpected benefits also arise from EMS implementation. An effective EMS is characterised by appropriate management mechanisms to minimise or mitigate adverse environmental impacts and/or emergencies. Staff will be well equipped to respond to emergencies and give top management assurance that the environmental risks can be avoided or minimised. The response will be underpinned by contemporary documentation including policies, procedures and guidelines. In addition, an EMS will protect the corporate reputation from negative publicity, and associated knock-on effects which may severely impact the organisation’s operation and financial liquidity. 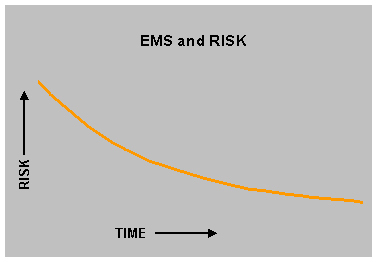 Implementation of EMS and associated risk over time. An effective EMS will be integrated into governance structures, existing management processes and education programs, and will be incorporated into investment decisions to improve infrastructure and technology. As time progresses, an EMS will form part of an organisation’s culture and corporate values – which will significantly improve environmental and financial performance. 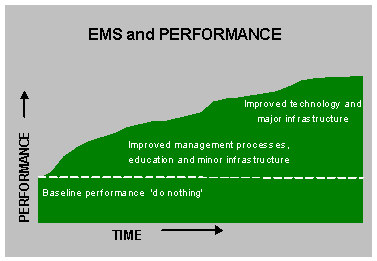 With ongoing support from top management, the EMS will evolve into a system that not only improves direct, but also indirect, environmental performance. The introduction of life-cycle assessment in procurement processes, other national and international standards, and certified eco-labelled products and/or requiring suppliers to have certified environmental management systems, are characteristics of an evolved EMS. Another feature of a ‘mature’ EMS use is often outreach to either market-chain partners and competitors in the same industry, to achieve better coordination and overall industry performance. Furthermore, an organisation with an effective EMS will have strong connections and support from the community, and will be proactive in stakeholder engagement and consultation.